Royal Bank of Scotland is to lead a $3.1bn (£1.7bn) investment in Bank of China, giving it control of a 10% stake in China's second-biggest lender. RBS said it would pump $1.6bn into the deal, which it will head on behalf of co-investors Merrill Lynch and Hong Kong billionaire Li Ka-shing. Foreign investors are increasingly keen to gain a foothold in China's vast banking sector. The market alone is estimated to hold $1.5 trillion in personal savings. However, experts have warned that Western banks risk exposing themselves to China's bad debt problems accumulated after years of state-controlled lending. Reports that RBS was considering spending as much as $5bn on the deal had recently hit the Edinburgh-based bank's shares. News of the more modest investment helped lift RBS's shares on the London Stock Exchange by more than 3% in morning trade. The deal will give RBS, Europe's second-biggest lender, a 5% holding in Bank of China, though it will control the 10% holding on behalf of its co-investors. RBS said it planned to sell its stake in Spain's Banco Santander Central Hispano for $1.6bn in order to fund its share of the deal. The investment in China is the company's first, and follows a string of major deals agreed between Chinese lenders and Western banks. Bank of America reached a deal in June to buy a 9% stake in China Construction Bank for $3bn, while UK-based giant HSBC paid $1.75bn last year for a 19.9% stake in Bank of Communications, China's fifth-biggest lender. China is keen to encourage foreign investment and expertise in its growing banking sector. 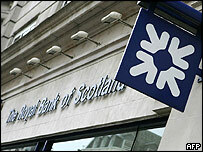 RBS chief executive Fred Goodwin said the deal would give the British bank access to Bank of China's 11,300 branches. "The deal we have announced, from Royal Bank's perspective, is low risk," he said. 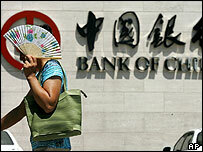 Analysts broadly agreed, welcoming the deal which will give RBS one seat on Bank of China's board. "This is positive for three reasons," said James Leal an analyst at London-based stockbrokers Teather & Greenwood. "It removes the uncertainty that had been affecting RBS shares, the investment amount is relatively small, and it will be good for them to have a foot in the door in China." Bank of China is widely seen as having the most international outlook of China's leading banks, boasting offices around the world and a listed subsidiary in Hong Kong. Its position as China's principal foreign exchange bank has also enhanced its profile in the eyes of would-be investors. Earlier reports had linked Swiss bank UBS, the Manila based Asian Development Bank and Singapore's Temasek Holdings as potential investors in Bank of China. Under the terms of China's admission to the World Trade Organization, consumer and corporate banking services must be opened to foreign competition from the end of 2006.